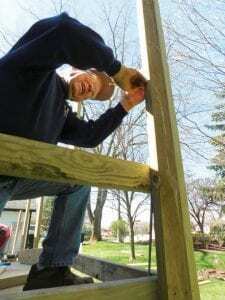 Hazen Germaine of Flint Township fixes protective barriers to the wheelchair ramp at Veletta Damon’s home. FLINT TWP. – Veletta Damon was eager to show her grandson, Jake, the new wheelchair ramp outside her home. Volunteers recently assembled at Damon’s home in South Valley Estates and spent the morning building the ramp she needed to get her grandson, daughter and husband in and out of the house safely. A second build, at the nearby home where Damon’s daughter and grandson live, will also take place. “When I saw the story in Swartz Creek View, and I saw the angle of that ramp they were using, I thought ‘that’s an accident waiting to happen,’” said volunteer Hazen Germaine of Flint Township. Germaine is part of a group from First Presbyterian Church of Flint, who donate their time to build ramps. He worked with Marty Phillips of Flint, Russ Sorenson of Otisville and Rick Brown of Otisville. He and Phillips were able to pull together some left-over materials from previous builds in order to get the job done. Additional help came from the United Way and UAW, as well as Michigan Lumber and Tri-City Construction. The projects, as well as an effort to convert a bathroom, were coordinated by Pastor Keith O’Neal and his organization, Good Samaritans of Mid-Michigan. Damon, a retired nurse who recently beat breast cancer, takes care of her husband, who has epilepsy and has suffered one heart attack and two strokes, her daughter, Lisa, who also has epilepsy; and Jake, who has Von Willebrand disease and angiohemophilia, and is quadriplegic. The Damons had proper wheelchair ramps at their previous residence in Mount Morris Township, which went into foreclosure because of mounting medical bills. They were using temporary, metal ramps that were at an unsafe angle, and Damon did not have the strength to push her grandson up the old ramps alone. Germaine said the appreciation of the family is very rewarding.